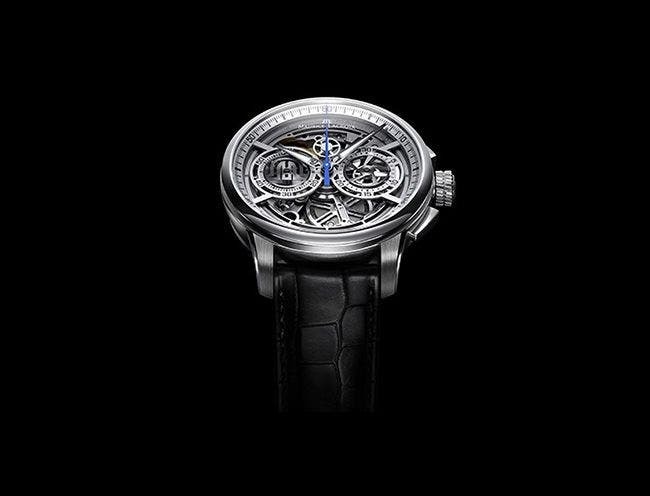 The Masterpiece Skeleton Chronograph combines the technical demands of an open-worked movement with a highly useful complication, the chronograph. The 45mm diameter case is here above presented in its steel case with silver toned dial finishing. The case masterfully blends contrasting polished and satin brushed surfaces, delivering a sumptuous, highly attractive appearance. Moreover, the arrangement of the various parts of the movement delivers a fascinating array of depths, inviting the wearer to look at each element of the watch. Appearing for the first time is a new automatic chronograph movement, produced exclusively for Maurice Lacroix. This movement features high-end finishing, including Côtes de Genève motif on the bridges and oscillating mass. The hour and minute hands are diamond-cut, lined with luminescent coating, delivering a green emission in restricted light. At 3 o'clock, a 30-minute chronograph is presented, whilst opposite, at 9 o'clock, a small second’s display resides. At the heart of the small seconds display a revolving 'M' logo rotates with absolute precision, providing a fitting signature for this latest Masterpiece from Maurice Lacroix.